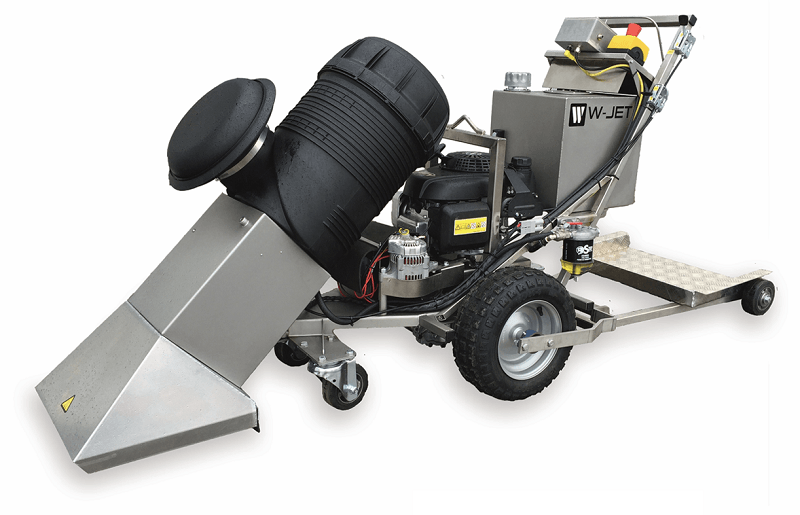 W-JET WASP: Self-propelled RoadDryer in stainless steel, with 45° tilt up to avoid melt damage on surface at start/stop. The M1 module can here be twisted left/right to go around sharp corners or reach up to curbs etc. Driven by a 3,5 HP Honda gasoline engine with 12V-47A alternator and battery to secure sufficient electric power supply, hydrostatic drive and variable speed forward/revers from 0 -6 km/h with electric speed hold, and optional “StepOn” Sulky. 33 litre W-Jet Fuel tank for app 1,5 – 2 hours drying. LED work light, 3 white, 4 yellow warning flash.